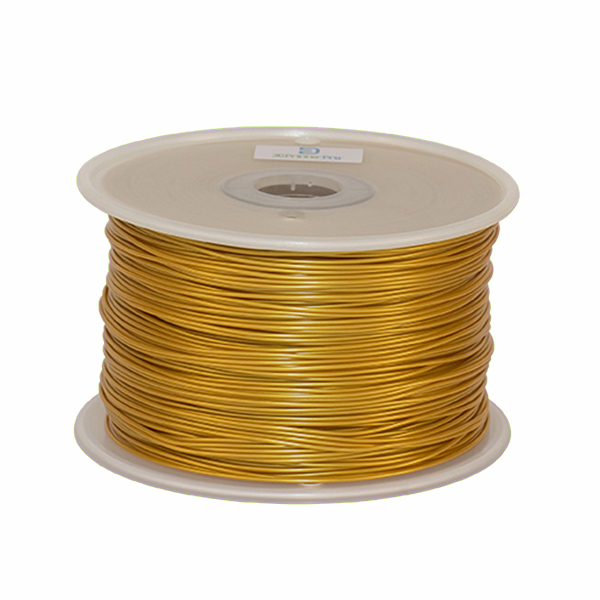 Our Gold PLA 3D printer filament for sale is available in 1.75mm or 3mm and stored on 1 Kg (2.2 lbs) spools. Jewelry makers, hobbyists, and crafters will enjoy 3D printing with gold PLA filament for prototypes and designs. Great color choice for 3D printing wearable items or jewelry prototypes! Our gold offers a glimmering yellow that is sure to light up your 3D printed object. 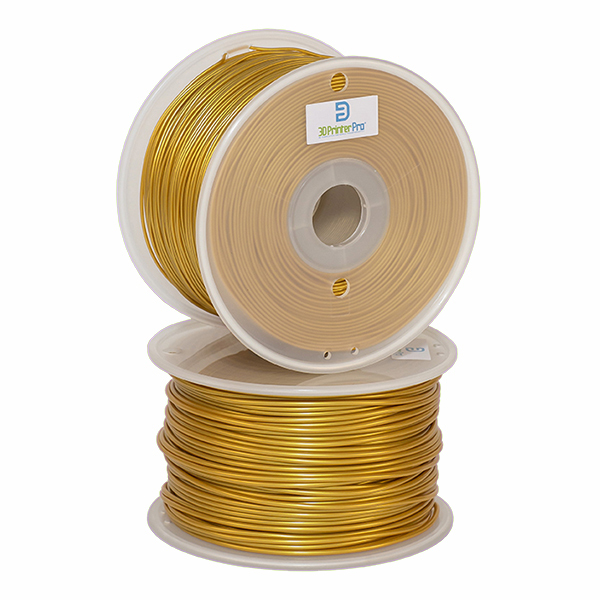 Both 1.75mm and 3mm gold PLA filament for sale is in stock and ready to ship same day. Polyactic Acid (PLA) is biodegradable and made from materials such as corn starch, tapioca roots, and sugarcane. Considered one of the most popular 3D printing filaments for sale today, it’s a multiple purpose material with high strength and minimal warping. Storage Requirements: Store in an airtight container or bag at room temperature. PLA will absorb moisture; thereby affecting the dimensional tolerances of your 3D printer filament. Use airtight storage containers, buckets, or zip lock bags to keep the material free from humidity. Compatibility: Our 1.75mm and 3mm gold Polyactic Acid 3D printing filament for sale is inspected, tested, and confirmed to work with all FDM (Fused Deposition Modeling) 3D printers. This includes popular brands such as Printrbot, Ultimaker, Afnia, Up!, Type A Machines, Solidoodle, Flashforge, Airwolf3D, Makergear, RepRap, and Makerbot (Replicator and Replicator 2). 3D Printing Helpful Hint: Depending on your 3D printer, you should expect to perform general maintenance every 50 hours of printing. This will include build platform calibration, axes lubrication, and firmware updates to your 3D printer’s control board. Fun Fact: From the beginning of its existence, gold has been recycled. This could mean some of the gold jewelry you currently own may be derived from older jewelry … made centuries ago! 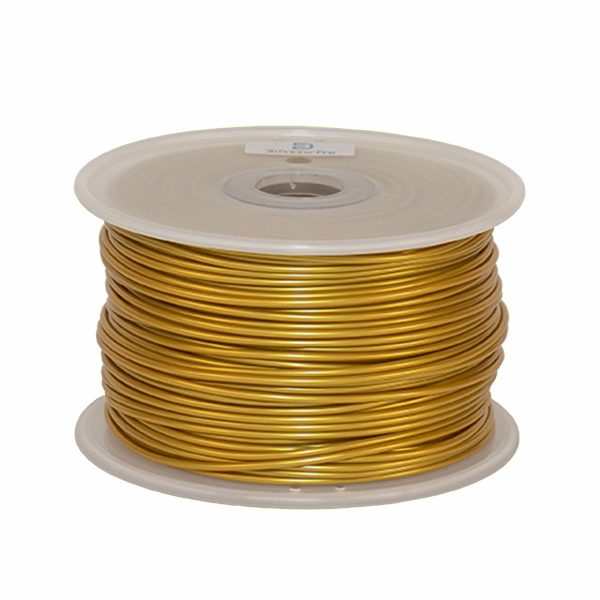 Have a question on gold 3D printing filament for sale in either 1.75mm or 3mm diameter? Contact us for additional sales help.